Chris wickedly doesn’t go down, preventing Quinn from finishing his instructions. Chris smirks and subtly messes with Quinn’s defense. Quinn pauses, signals Chris to stand up again. Chris complies. Categories: Aikido Moments | Tags: aikido, martial arts, Saturday mornings | Permalink. Doug knits his brow, opens his mouth, then shuts it again. It’s hard to believe it was three years ago that I hopped a plane on a whim and flew to Fresno, CA, to visit with a friend and hike Kings Canyon National Park. In fact, it is almost to the day. I wrote this back then and posted it elsewhere, trying to make sense of all the teeming emotion I’d felt on that ridge. 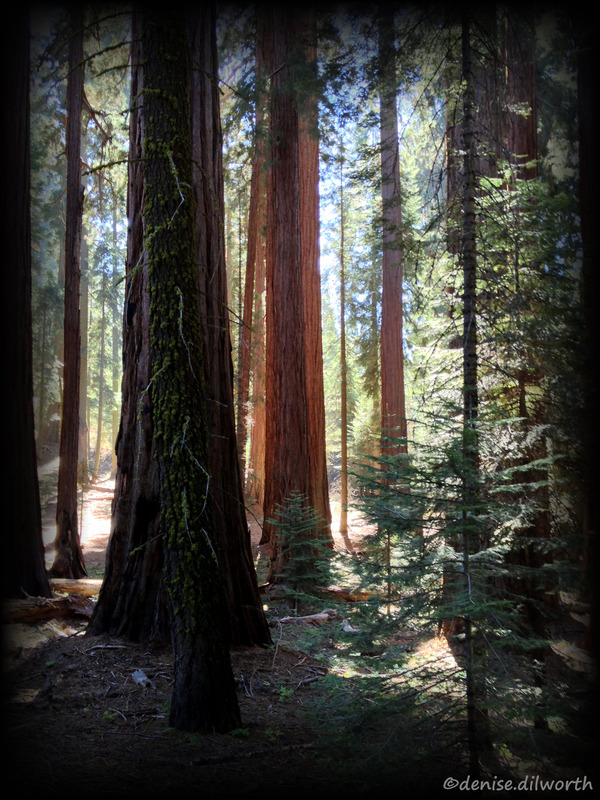 Standing among the redwoods and sequoias stirred something in me that I thought had died. It’s been a long waking, but I am finally opening my eyes again. The ridge is the only place where I struggle to breathe. The altitude is part of it — I’m approaching 7,000 feet — but it’s mostly the exertion of climbing switchback after switchback to a grove called The Sugar Bowl. The way is sometimes open and rocky, sometimes overhung with twisted, stunted oaks and a few pines of various species. There are overlooks here and there, previewing tomorrow’s climb: the Big Baldy Trail. Silver-leafed brush reaches out and tugs at my boots, and I watch for rattlesnakes because, yes, diamond-backs are sometimes spotted even at these elevations. Big Baldy is a silent, impersonal presence off my left shoulder. He peers through the trees at me where they open to reveal his pate. I’ve seen only two other humans on the trail — a young, energetic couple climbing down the switchbacks I’m ascending — and the effect is of having the park to myself. Kings Canyon National Park is an archipelago of park lands, interrupted in places by seas of national forest land and wilderness areas. It abuts Sequoia National Park, its sister park, a little south of where I’m hiking. But only the maps know the boundaries. From where I stand at that moment, they don’t matter, except that they protect this slice of the Sierra Nevada from logging, cattle, and development. The trail bends around a rise and disappears into the forest ahead. I turn with it and enter the Sugar Bowl Grove. There are two hikes I’ve taken in my life whose beauty has literally brought me to my knees. This is one of them. I have entered a pristine grove of sequoia topping Redwood Mountain. It lacks the well-mannered, museum feeling of Grants Grove, where the third-largest sequoia — the General Grant Tree — and his massive neighbors are safely corralled behind fences, apart from the scores of tourists who visit every year. This grove is a riot of growth. Among the huge sequoias grow redwoods, white pine, ponderosa pine, red and white fir, and the sugar pine for whom (I think) the trail is named. Generations of sequoia stand together: tiny seedlings, slender saplings, cone-shaped adolescents, and ancient giants, some of which are more than a thousand years old. I’m dumbstruck as I fumble with my camera, pointing my lens this way and that, trying to find something on which to focus. I can find no way to capture what I see, what I’m experiencing here. How do I record the depth? The light? The greens, sages, cinnamons, golds? How do I convey the enormity of the towering giants surrounding me, sheltering their growing legacies, reaching roots deep into the soft soil? By what means can I bring back with me the scent of cinnamon seeping from bark warmed by the golden afternoon light? I simply can’t. But I snap photos anyway, tears streaming down my face. 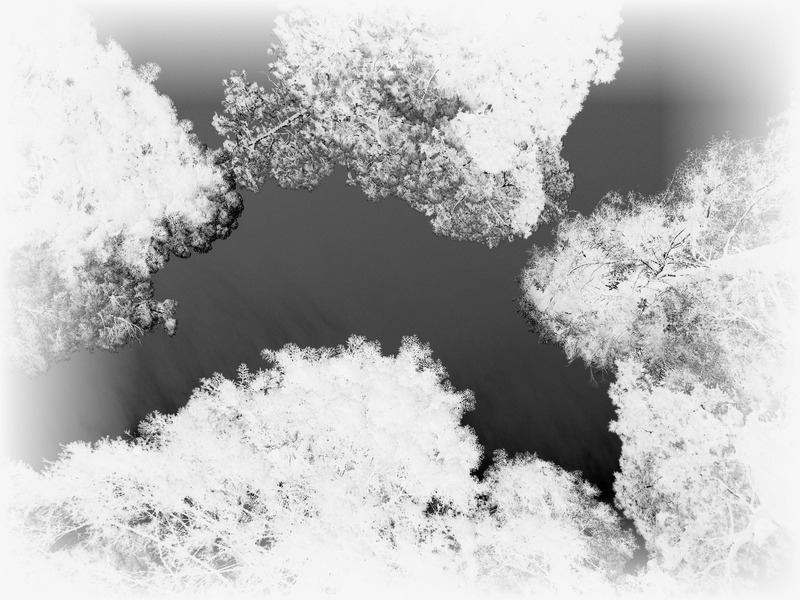 Looking up into the treetops, the beauty is almost painful. When I finally continue on the trail, walking deeper into the woods, I am shaken. It’s difficult to breathe again, but not because the walk is strenuous — it isn’t — and not because the air is thin. I’m still gasping from the awe of the place I’m leaving behind me, one heavy, regretful step at a time. Categories: Musings | Tags: hiking, Kings Canyon, women hikers | Permalink. Categories: Found Poetry | Tags: magnet poems, poetry | Permalink. Frank and I face off. I move quickly toward him, a wooden practice knife — or, tanto — gripped firmly in my right hand. At the last moment before I enter Frank’s space, I playfully switch the tanto to my left hand and jab him lightly in the ribs, throwing off his defense and forcing him to adapt his technique. Frank laughs and smiles that brilliant, open smile of his. “Thank you!” he exclaims, with a twinkle in his eye. He has accepted what was given him and learned something from the exchange. For about a year, I trained in aikido, a Japanese martial art brought to this country back in the 1970s by a man named Mitsugi Saotome. Aikido was appealing to me on a number of levels, but it was how my fellow dojo-members — especially my teachers — responded to the practice that made it feel somehow right for me. When the technique’s essence is captured, and the uke (attacker) finds him- or herself hitting the mat, there is almost always a smile, a laugh, a congratulatory “Yes!” or “Nice!” to the nage (defender). The energy in the room was light, playful, happy. And, yet, we were engaged in attack and defense. As I trained over those months, I had this funny, nagging bit of memory knocking at the back of my brain every time someone fell to the ground with a smile or a laugh. It finally broke through: The Three Vinegar Tasters. The Three Vinegar Tasters is a painting that comes from Eastern tradition and its story goes something like this: Confucius, Buddha, and Lao Tzu are pictured around a vat of vinegar, which represents life. Each of the men has dipped his finger into the vat and tasted the vinegar, and his facial expression reflects the nature of his philosophy about life. Confucius wears a sour expression; Buddha’s grimace is bitter. Lao Tzu, however, smiles with an expression of “Ah, yes!” And why shouldn’t he? Life is, after all, perfectly itself. In my observations, martial artists can also be vinegar tasters. Certainly, some wear sour expressions as they practice. Some look angry or bitter. Many look as though the practice is a strain. But I somehow landed in with the smilers. So, in addition to feeling (especially on some Saturday mornings) like I’d just walked into a roomful of rowdy brothers, a pile of squirmy puppies, or a gang of otters at play, I also associated my dojo-mates’ smiles as they tumbled and rolled with the smile of Lao Tzu. There was an “Ah, yes!” expression on their faces as they learned from the energy they exchanged with one another. Any why wouldn’t there be? That energy — attacking, defending, moving in agreement — is perfectly itself. These are a few of the moments I captured and recorded after our Saturday morning training sessions. These people made me laugh, made me bruise, and brought me back into myself at a time when I felt so very, very lost. I am grateful to them all. Categories: Aikido Moments | Tags: aikido, martial arts, Taoism, Vinegar Tasters, Zen | Permalink.